Facebook Live. That was the platform chosen by Jair Bolsonaro to issue his first statements after learning of his triumph in the presidential elections in Brazil in October 2018.1 It was not a speech at the headquarters of his party or in a public place. It was not the television channels or the radio stations that intermediated in the communication with the citizens. More than 300,000 people saw their statements live, and within the hour there were more than two million people who had seen his eight-minutes long message, approximately, quickly registering nearly 350,000 comments and reactions. The elected president of the continent’s largest country, who has 8.7 million followers on Facebook and 2.4 million followers on Twitter, chose social networks as a platform for his inaugural message. New technologies and platforms, but nevertheless a phenomenon already known: citizens supported a kind of “savior” or “solution” against the disenchantment with the ruling elites of recent years. The fragility of institutions in Latin America continues to be a central challenge for governance. The dissatisfaction of citizens with their governments is channeled in many cases towards the search for “magical” or prompt solutions, which are usually conducted by caudillos—strongman-type leaders. This configures a scenario where the people (the leader), and not the institutions, are those who seek to respond to the problems that affect a country. The institutional environment is weak and vulnerable. The amplification of the use of social networks and platforms in political activity has been a growing trend and has shown a more active and participatory citizenship in political processes. But this activation and participation has not implied – until now – relevant changes in the quality of the institutions. Therefore, and beyond the amplification of the use of social networks and platforms in political campaigns, how much is Latin America changing in the quality of its institutions? How are the opportunities that technology and information offer being seized to move faster into the future? How are new technologies influencing current and future governance? When asking broader questions, the answers are more uncertain. Significant changes in the form of political and social interaction can be identified, changes in citizen control of political activity, but there is still no significant change in the quality of institutions and their capacity to bear sustainable progress over time. The institutions remain vulnerable to the caudillos and to populist offers to face the great pains of the continent. Regarding the use of technologies to improve development and progress capabilities towards the future, the Latin American continent is a follower of what other countries in North America or Asia lead. It does not show leadership capacity or substantive innovation. But these advances in the adoption of technologies and innovation seem to move more slowly in two key areas. The first is the modernization of the state and governments to provide better services to its citizens taking advantage of new technologies and innovations. The second is the lack of innovation in the business models and productive strategies of the countries. Probably the common element of these lags is the weakness of political and social institutions in the continent. An adequate understanding of the challenges of technologies for current and future governance requires a review of other aspects of the Latin American evolution. The history of the continent is a story of slow but sustained economic progress, with significant achievements such as the reduction of poverty, the development of a growing middle class, and the concentration of more than 80% of the population in urban areas. But at the same time, political and institutional instability has become a constant that threatens the ability to move faster towards higher levels of development and welfare. This document is organized as follows. To contextualize the analysis, the political and institutional evolution of the continent is briefly reviewed. Next, central aspects of the economic, fiscal, and quality performance of public spending are described. Then some of the impacts that this growth has had on the social evolution and the welfare of citizens are analyzed. Subsequently, and in line with the above, the importance that immigration and demographic changes are having in Latin America is discussed. Then, some of the opportunities and challenges that digital transformation presents for governance towards the future are described and analyzed. Next, the particular case of Chile is described. Finally, the conclusions are presented. It has been very difficult to configure and consolidate the rule of law in the continent, in spite of a few exceptions.10 The process of independence during the first third of the 19th century was a process of destruction of the colonial state, without the preparation or construction of an alternative model to offer governance and a future. The lack of institutional design and impersonal mechanisms led to the emergence of caudillos and individual leadership as a way to fill that gap. In this way, power is configured around the leader and not around the institutions. When power and authority are configured in relation to the caudillos and not to the institutions, the principle of legality weakens or disappears. Therefore, in Latin American and the Caribbean (LAC) there have been many caudillos who have understood the state as a personal patrimony and have acted for their own interests rather than for general interests. The problem, evidently, is that there have been no institutional counterweights to avoid this abuse of power. Even this view of the state as patrimony has been manifested in the fact that the caudillos repeatedly seek to refound their states to adapt them to their own goals and purposes. Without a doubt, this has been a relevant source to explain the corruption phenomena that continue to be observed nowadays and that have led various leaders of the region to face charges of corruption in recent years. Latin America today lives the paradox of having a majority of democratic nations that grow and progress, but at the same time it has diverse places on the continent – even in those same democracies – where the rule of law does not operate. There are still places and territories controlled by the guerrillas, crime, or drug trafficking, and where the state is not able to impose its order or ensure control. This can also be explained by the emergence of armed groups under the leadership of caudillos in the states in formation. Why has it been more difficult in Latin America than in other places to establish the rule of law and stable democracies with institutional mechanisms that can face the abusive attempts of a caudillo? Why so much fragility and disposition to the revolution, to the manifestation, and to the abrupt change? Mauricio Rojas raises an additional argument, which complements the institutional approach.11 He points out that one of the main reasons for this reality is the enormous inequality of conditions that has been observed for centuries in the American continent, which has made a large majority of citizens not feel part of the institutional arrangements and be willing to participate in revolutions or social movements to achieve a better situation. In other words: the cost of participating in social movements or revolutions is very low, because there is little to lose. This contrasts – in his opinion – with the conformation of the state in the United States. He recalls that the first observation of Tocqueville12 when referring to the democracy of the United States was to highlight the equality of conditions that he had observed in the country (in the north of said country), and how this influenced the cultural and institutional dynamics, and finally the adherence to democracy. The existence of free men, owners, merchants, and artisans, whose standard of living was not so diverse, facilitated social cohesion to install a new experiment such as the democracy of the United States. Everyone has incentives to take care of the built order. The caudillos have mobilized the population around inequality. They did it in the past and continue to do so today, with different mechanisms or tools. For a long time, the instrument was the revolution and the guerrilla. Today the mechanism seems to be the appropriation of the state, or the gradual death of democracy from within. The economic progress of the region has managed to incorporate and make active participants of a significant mass of the population that was excluded from social life. The reduction of poverty has been significant, and the strengthening of the middle class has been overwhelming. This may have contributed to diminishing the revolutions and coups d’etat, because there are more people who feel part of social progress and who face the costs of participating in these actions. But these advances have not solved all the problems. Progress has brought new challenges and new forms of mobilization, in most cases through – again – caudillos that activate the postponed population. The institutional weakness and the personalization of the state has led the political discussion on the continent to be more about people than ideas. In that sense, Peronism, Chavism, and Fujimorism, are only examples of agglutinating factors beyond doctrines, ideas or political parties. Therefore, the party systems are fragile and do not usually have a forcefulness in their programmatic platforms. 14 Politics is built mostly around the leader. Because of these dynamics, in the seventies the region was characterized by a high level of conflict, as well as low economic growth and income per capita similar to the one observed today in the poorest countries of the world. More than half of the population lived in conditions of misery, excluded from the minimum welfare systems. This state of affairs led the democratic regimes of the region to be unable to provide a solution and to end up yielding to the democratic fractures in almost all countries in the region, with exceptions such as Colombia, Venezuela and Costa Rica. Although the military regimes responded to the lack of order (pre-revolutionary situations), they were not able to carry out successful reforms to change the growth trends, apart from exceptions such as Chile, which even anticipated the changes that many democracies recently implemented with the collapse of the Soviet Union. With the advent of democracy, the region has maintained certain patterns of institutional stability, albeit fragile. This has allowed low but sustained growth and very important and positive social policies, which have managed to include as part of society groups that were postponed and excluded for decades. Today, the picture is one where fragile democratic systems exist and new socio-economic sectors are participating in public and social action. Although important portions of poverty still can be observed in the region, these do not present the exclusionary characteristics of the seventies, and, on the contrary, an increasing number of middle and upper middle sectors can be observed, whose demands usually generate enormous challenges for governance. In short, the evolution of LAC has been turbulent in the last decades. However, despite the disappointments, frailties and frustrations, Latin American institutional history is a story of improvements and progress. A similar situation can be observed in economic and social matters. While the world will grow close to 3.7% during 2018, Latin America and the Caribbean (LAC) will grow only 1.2%.16 Both the global and continental growth projection have had reductions throughout the year. 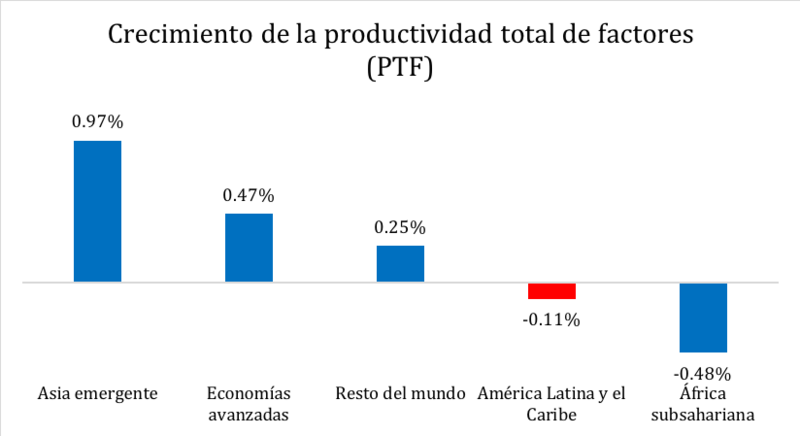 However, while the global growth projection was reduced -0.2 percentage points during the year, the LAC growth projection was reduced by -0.8 percentage points.17 The economic performance of the continent is strongly affected by the reality of Venezuela, whose domestic product is projected to decrease about -18%. Without this exceptional case, the growth of the region would approach 2.5% for this year. Both in 2017 and in 2018, regional growth will be less than 1.5%, with a further advance towards levels of 2.2% expected for 2019. 22 The main basis of this growth rate are found in the situation of Mexico, Brazil, Argentina and Venezuela. Mexico shows an upward trend of 2.0% in 2017, and projections of 2.2% in 2018 and 2.5% for 2019, driven by the growth of the United States. Brazil also shows an upward trend, with a growth estimate of 2.4% for 2019, even though expectations have moderated downward in recent months. In Argentina, on the other hand, the evolution has been negative. At the beginning of the year the growth projections were positive, but today the expectation is a decrease of -2.6% for 2018 and -1.6% for 2019, resuming the positive growth only in a medium term. The Venezuelan situation is dramatic, as 5 years of economic decline have accumulated, with a projection of -18% for 2018 and -5% in 2019. In Venezuela, close to 50% of GDP has been destroyed throughout this deterioration process. If the economic situation is of modest growth, the fiscal situation on the other hand is precarious and demands attention. By 2018, it is expected that 29 of the 32 countries in the area will have a negative total fiscal balance.23 As expected, the public debt is growing, reaching an average of 60% of the regional GDP this year and affecting the credit ratings of some countries, such as Chile and Brazil. During 2017, Fitch reviewed the credit rating of 8 countries, making 7 reductions in the credit note and only one revision upwards. This, added to the fall of the net inflow of capital to the region, has contributed to increase the risk premium and the access and cost of financing. The World Bank has pointed out that fiscal deficits and the increase in debt limit the options of using fiscal policy as a countercyclical tool at times when some consider it necessary.24 For this reason, it is necessary to accelerate the process of fiscal adjustment in a large part of the LAC countries, taking precautions to maintain prudent levels of public investment in infrastructure and social programs to support the most vulnerable. It should be remembered that during the commodities boom, the governments of the continent had more resources to develop infrastructure programs and social initiatives. At the end of the cycle of high prices, governments have faced the social pressure to maintain their initiatives and programs but at the same time reasonably adjust their levels of public spending. This leads to the analysis of the quality of public spending in the continent. It is necessary to do more with less, reaching higher levels of efficiency and effectiveness in public spending. The recently published IDB report “Better Spending for Better Lives: How Latin America and the Caribbean Can Do More with Less” is very timely, therefore. 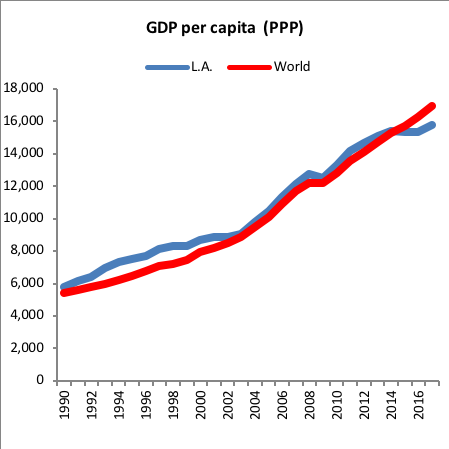 Since the 1990s, there has been an increase in the level of public spending as a percentage of GDP in LAC. Although this increase has been significant, it is still far from the levels of spending observed in developed economies. In LAC it is projected that public spending in 2018 will be close to 22% of GDP compared to levels of 40% in more developed economies. The evolution has been interesting, since an average increase of 7% per year has been observed in the last twenty years. However, not everyone considers that there is an equivalent improvement in terms of human capital or physical capital, or lasting social improvements. 25 The quality of the expenditure requires a lot of improvement towards the future. Many countries of the continent spend inefficiently. 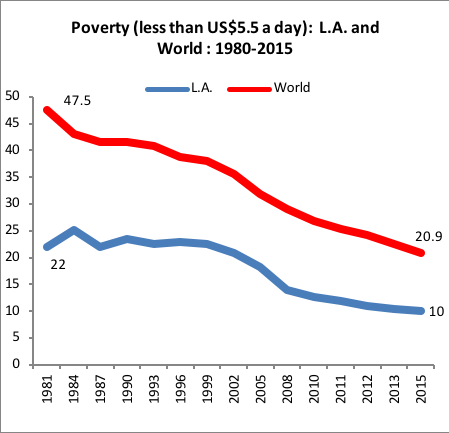 The challenge for LAC is not necessarily to spend more but to spend better. The social changes that the continent has seen in recent decades are impressive, with significant decreases in poverty levels, a growing middle class, and a concentration of the population in the cities close to 80%. These changes have also affected the composition of public spending. In the region, there has been a tendency to reduce capital expenditure and favor current expenditure, a matter that responds in part to the contingent pressures of the citizenry but risks capacity and potential for future development. The economic challenges on the continent are quite big. The end of the commodity cycle, the need for fiscal adjustments, the increased demand for spending by an empowered middle class, fragile political institutions, and an outdated productive structure demand a revision of the strategy. New technologies and the emergence of new forms of information offer a new opportunity. 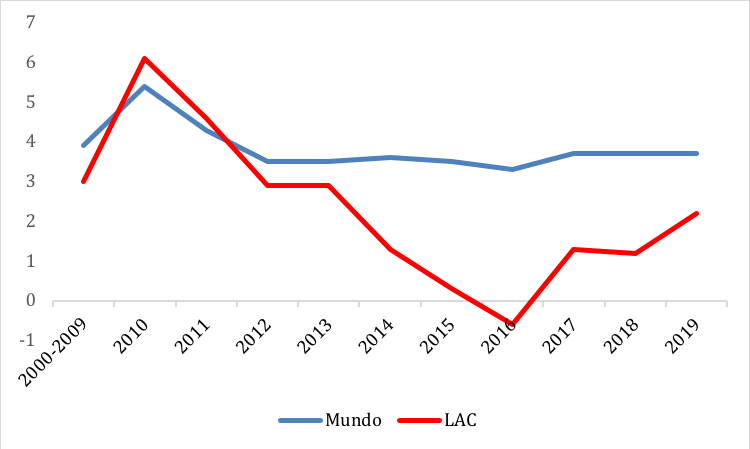 To persevere in its current development strategy, LAC risks continuing with moderate growth, with high dependence on commodity price cycles, and decreasing its relative leverage in the world economy. The opportunities that Latin American societies have to join the way of technology, innovation, and information are fundamental. They require a population with a good educational level, governments capable of reacting to new opportunities and lead changes, and a private sector that has the incentives to invest looking into the future. Next, some elements of the social evolution of the continent are analyzed. Perhaps the most relevant change in the social composition of Latin America is the advance in the reduction of poverty and in the consolidation of an emerging and active middle class. This evolution has had a direct impact on the way in which governability and changes in social mobility are articulated. 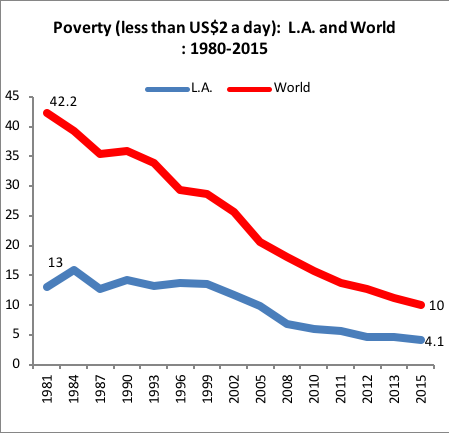 In relation to the reduction of poverty, Latin America exhibits a paradox. On the one hand, both the levels of extreme poverty and those of total poverty are lower than the world average (see Figures 4 and 5), but on the other hand, in the growth of the per capita product, the performance of the region does not seem to be better than the world average (Figure 6). 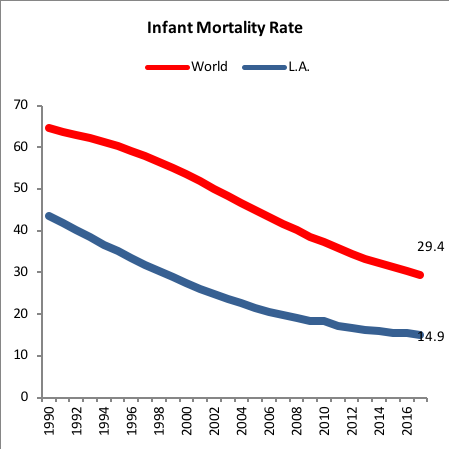 Social progress in terms of poverty reduction, life expectancy at birth, and infant mortality are just examples of the evolution of recent decades. This leads to the question of how governments should face the future, considering that the region has sustained economic growth but at low levels and with social policies that have allowed access to basic services or utilities to the population better than the world average. The governance of the future faces a new political, social, and technological scenario. These groups that left behind poverty and joined the political and social life are those who emerge as new protagonists of political action. Although their demands may be clientelist like many others, the central element of these middle-class groups is the search for order and equality, sustained growth and security, which requires governments to adapt to respond to these demands. Fiscal stress is much greater because the type of goods they demand are much more expensive in a context of low growth. But there is another characteristic of these groups. Throughout the last decades, the social policies of expanding access to education have been very relevant in the continent. Therefore, these middle-class groups are more educated and enlightened than in the past and have a more skeptical view of political affairs. Even though in LAC the populist temptation and the search for magical solutions are still present and current, this has been concentrated in the most vulnerable sectors. The new middle classes have a look of greater distrust of the promises of political rhetoric. The new middle groups do not share the vision of the salvific dreams that remain rooted in the popular sectors of the continent. Thus, as the middle-class groups in LAC continue to grow, there is hope to reduce populist offers. The new middle classes have progressed a lot in the last decades and in each election they have much more at stake than in the past. They know that a good or bad government affects their present and their future. In this sense, they are impatient and politically less loyal groups, which in a context of institutional weakness and even in the presence of solid institutional structures, supports short-term political changes that may not be the most appropriate. In this regard, the cases of Chile 2010-2018 demonstrate this. To finish this section, and before entering into the challenges of the digital revolution for governance, it is necessary to remember that the social reality of LAC shows that the continent is progressing but still very vulnerable. Various examples for the above. The first of these is the educational performance, which shows that the Latin American continent has worse performance and achievements than other emerging regions such as Asia.28 The second is the Human Development Index of the United Nations.29 There are very few Latin American countries that have a “very high” level of human development (Chile, Argentina, and Uruguay), and the progress of the region as a whole has been slower between 1990 and 2017 than in other regional areas, like Asia and even places in Africa. A third example that invites reflection and concern about the instability of the continent are the figures reported by the OECD in its report on social mobility. 30 That report shows that inequalities – despite having declined in recent years – are still very strong and that it is difficult to observe relevant levels of social mobility. It argues that still the place of origin is a very strong predictor of the future destiny of the inhabitants. Moreover, it points out that this has affected a greater despair and distrust in governments and their capacity to offer better future prospects. In terms of aging, the continent will see an acceleration of the process. 34 Mexico, Brazil, Colombia, and Chile, for example, will see their population of older adults increase rapidly. In the case of Mexico, the country will surpass the United States in percentage of older adults by the year 2060. 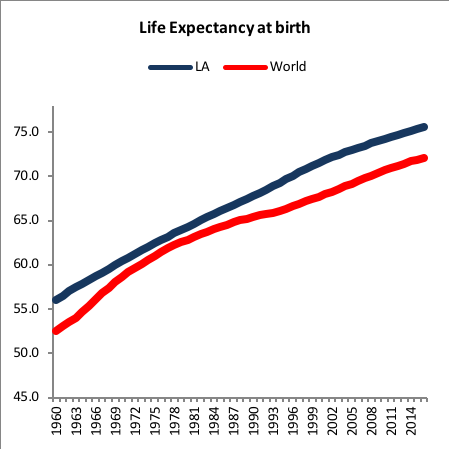 Chile and Brazil, meanwhile, will overtake the United States in aging by 2050, something difficult to think a few decades ago, and its explanation would be centered on the fertility rates observed in these countries in the last time. Given this scenario, what opportunities does the digital revolution offer to accelerate the road to the future and progress? Digital Transformation in Latin America: A Leapfrogging Opportunity? Challenges and opportunities of the digital revolution for governance and progress. The arrival of the fourth industrial revolution found Latin America at a special moment, as previously indicated. What are the opportunities and challenges facing the continent in terms of technological and digital transformation? We will begin the analysis by briefly describing the connectivity and infrastructure situation in the region. In terms of access and infrastructure, 56% of the inhabitants of LAC used the internet during 2016.35 Between 2010 and 2016, the percentage of connected households increased by 103%, even though there are still many that do not have access to the internet. The gap between LAC and the OECD in terms of households with Internet access, for example, has been reduced significantly: while in 2010 the gap was more than 50 percentage points (73.2% in the OECD compared to 22.4% in LAC), at present this gap is slightly higher than 40 percentage points, that is, a significant change.36 This advance has been accompanied by a greater penetration of the internet in the lowest income socioeconomic quintiles. More than 80% of the continent’s population lives in the urban world, compared to about 40% in 1950. In reviewing the difference in internet access in the urban and rural world, it is observed that in countries like Bolivia, El Salvador, Peru, Paraguay, and even Mexico, the connectivity gap between the urban and rural world is very high. In contrast, in Chile, Costa Rica, and Uruguay, the gap is much smaller. On average, the urban-rural Internet access gap in 2017 reached 27 percentage points. The differences between access to Fixed Broadband and Mobile Broadband have also evolved. While in 2010 the penetration of both was similar, today the reality is very different, with a strong growth of mobile broadband (reached 64% coverage) while fixed broadband reaches a lower coverage (11%). However, in terms of digital economy and competitiveness, LAC is below the world average in important aspects of electronic commerce (B2C). Thus, for example, in the individuals that use a credit card, the percentage in LAC is lower than the world average, and very far from the developed economies.39 Similar situations occur in areas such as the number of secure servers per million inhabitants or postal delivery at the home address. The digital strategies of governments also show interesting figures. 73.9% of the countries have a digital government strategy for use of ICT in the public sector.41 60.9% have performance indicators of progress in electronic government, and an identical percentage has a national portal for public services, a very relevant issue when it comes to bringing services to citizens.42 Digital identity has also advanced, albeit somewhat more slowly, with 56% of countries that have a legally recognized digital identification system. Some Areas of Opportunities and Challenges. The fourth industrial revolution (4IR) is impacting the way governments, businesses, and economies are organized in general. Like other industrial revolutions, this generates uncertainty and opportunities. But this 4IR has some differences with the previous revolutions.44 Firstly, the speed: while previous revolutions took decades to generate impact, the new technologies act very fast and therefore demand a rapid capacity for action and response from governments and businesses. Secondly, the 4IR is propelled by a diversity of technologies, materials, new discoveries, and tools, which makes it a more complex and difficult dynamic to assimilate. Thirdly, this revolution impacts whole systems, not being limited to the development or change in one kind of product. These differences with other industrial revolutions imply that leaders must act differently to take advantage of the huge opportunities. Which technologies are leading this industrial revolution that threatens to change the way in which social interactions are structured? Artificial Intelligence, Blockchain technology, Internet of things, cloud computing, virtual reality, and augmented reality are the axes that propel changes. They also highlight the use of 3D printing, Advanced Robotics, Mobile Internet, and Social Networking. These technologies are generating a constant process of disruption in which digital transformation has the potential to boost growth in various areas, transform public services, and improve the welfare of the citizens as long as information, knowledge, and data are available for everyone. These emerging technologies affect governments because they reduce the costs of providing public services to citizens efficiently, but at the same time they demand that the government be reorganized and restructured in order to take advantage of these enormous potentialities. These are technologies that favor collaborative, open, transparent, democratic, and flexible mechanisms, imposing on governments the challenge of adapting their structures to be efficient and effective in the response. For Latin America and the Caribbean, a continent that has grown slower than other emerging regions, the central question is whether this 4IR will allow a significant leap in order to accelerate the pace and approach development and growth to other regions of the world.45 That is difficult to answer today, because many efforts of governments, companies, and educational institutions are required to develop the basic conditions that allow opportunities to be seized. In what areas can the potential of the 4th industrial revolution be seized in LAC? Here are some examples. In terms of fintech, for example, the opportunity is huge. Nearly 50% of the population of the continent is not part of the banking system, and the development of electronic money, new methods of payment, and the penetration of fintech generates a very positive and significant opportunity for social inclusion and reduction of inequalities. Access to goods and services is very important in a continent that has a high rate of urbanization (over 80%). This generates conditions for Ecommerce to take off with great force in the region, increasing competition, improving the quality of services and bringing to citizens a diverse range of goods that empowers people and that boosts entrepreneurs. The advances in eHealth are perhaps one of the main opportunities that the 4IR implies. It is in this area where the opportunity of leapfrogging is evident, leaving behind outdated technologies and models, and making a significant leap into the future. Latin America is aging and requires new forms of health care. The costs of traditional health care systems continue to grow, as well as the costs of the insurances that covers these risks. It is becoming a situation difficult to manage towards the future, therefore, it is necessary to rapidly take advantage of eHealth opportunities (defined by the World Health Organization as “the use of information and communication technologies (ICT) for health”).46 The applications of artificial intelligence for medical diagnoses and the uses of 3D printing are just some examples of the enormous world of opportunities that the industrial revolution offers in health. To take advantage of the opportunities of the 4IR, the continent needs to train minds, then machines, and not vice versa. The formation of human capital is at the heart of the challenge of countries to take advantage of the opportunities of the technological revolution. With the massive dissemination of the internet, and the growing access to smartphones, the capacities for strengthening the offer and quality of education are massive. The educational process is aimed at individual, personalized strategies that are able to take charge of the realities and interests of each student, in each of the stages of their lives. 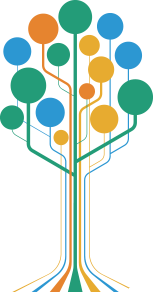 The 4IR is challenging the traditional models of school and university education, giving way to mixed and personalized models of education, which allow that even in remote places, very vulnerable people can access personalized and top-level educational models that allow them to compete in knowledge and skills with other citizens. Linked with the above is the development of skills for the future. The digital transformation is revolutionizing jobs, and it is very difficult to predict today what the future jobs will be. There are studies that indicate, for example, that about 45% of existing jobs in OECD countries have a significant risk or high risk of being automatized in the coming years.47 In the case of Chile, that risk exceeds 50%. This means that one of the main challenges of societies is to take advantage of technologies to develop dynamic and up-to-date models that accompany the Life Long Learning of people, allowing them to adapt to the new competences and skills demanded. Another huge opportunity is related to cities. If in the past the discourse was about of the moment of empires, later was about the moment of nation-states, today is about the cities. In LAC more than 80% of the population is concentrated in cities. Although this offers many vulnerabilities and complexities, it presents even more opportunities to improve the quality of life and provide services of excellence. Thus, smart cities are one of the main opportunities that Latin America has in order to improve the lives of its inhabitants and offer better conditions for the future. Smart cities can be defined as those that apply information and communication technologies with the aim of providing infrastructure that ensures sustainable development and improves the quality of life of its inhabitants48. Mexico City, Sao Paulo, Rio de Janeiro, Buenos Aires, and Santiago are just examples of large cities that concentrate problems and opportunities that can be addressed by smart cities. Congestion, pollution, efficiency of public services, ride sharing, urban planning, and intelligent monitoring of crimes are just examples of the enormous potential of these new technologies. In line with the above, governments can simplify procedures and processes to take advantage of the growth of Internet access and smart devices to simplify processes and improve the quality of care. As previously stated, governments should not only limit themselves to digitizing procedures, they should rethink all the documentary and procedural requirements that are currently being demanded from their citizens, taking advantage of the enormous information available and the new technological capabilities. In terms of citizen participation, the mass usage of networks and platforms is allowing people to participate in new forms of dialogue and civic debate. New applications have also allowed citizens to be more informed of what is happening in their surroundings, generating greater conditions for transparency, accountability, and response capacity to be demanded of the authorities. This has happened simultaneously with a change in the interaction between citizens and authorities, moving towards more horizontal models of interaction. Finally, and in line with the above, there is a need to give new impulse to entrepreneurship and innovation. The opportunities are there, and the ecosystems have been developing, although slower than necessary. There are already several unicorns that have emerged from the continent, but the potential suggests that much more can be done, as long as there is a favorable and stimulating environment for entrepreneurship and innovation. As can be seen, the opportunities are several. But so are the challenges. Below are some of the main challenges for LAC to take advantage of the opportunities of the technological and industrial revolution. The first is cybersecurity. Today there are more than 20 billion attacks per day in the world, and Latin America is not exempt from this problem. The increase in the usage and applications of the Internet of Things (IoT) allow an improvement in the lives of citizens, but also involve the risk of cyber-attacks and exposure of information to eventual aggressors. As in the case of IoT, cloud computing is also highly exposed to cyber-attacks. Latin America is especially vulnerable to cyber-attacks because many countries in the region do not have the capabilities and technologies to face these risks. There are countries that have progressed and have much to contribute in the regional context. But the general picture is of vulnerability and risk, and therefore requires a specific advance in education, technology, and strategy to minimize the risks of cyber-attacks. A second challenge is human capital. LAC needs to move faster in the formation of human capital to take advantage of the opportunities of the digital transformation. This means not only in the private sector but also in governments and civil servants. A third challenge is the protection of the privacy of personal data and the updating of institutions that safeguard individual freedom and respect the rule of law. As we have previously indicated, LAC is a continent with a fragile institutionalism, vulnerable to warlordism and to control by the leader. In an environment where information is crucial and where personal history can be manipulated, the need to have institutions that play the role of a counterpart to the authority is fundamental to give certainty and to safeguard individual rights. This is a central challenge and for which much more discussion is required, given the institutional history of the continent. Finally, it is necessary to mention the enormous challenge that new platforms and social networks are presenting for the political system, in a continent that has been moving from poverty to middle class, and in which citizens are more actively participant to political and social life. We mentioned at the beginning of this essay that Jair Bolsonaro, the new president of Brazil, had chosen Facebook Live as the platform to transmit his first message once elected. It was not the traditional radio or television channels; social networks were the protagonists of the most relevant political communication of the last year in the largest country on the continent. The entrance of social networks, especially Facebook, Twitter, and WhatsApp, has revolutionized political communication. This has allowed a more direct interaction between citizens and their authorities and has generated dynamics of unprecedented political activation. All this has been very positive, since it has allowed the inclusion of groups that were excluded and that today find new forms of participation and rapprochement. But just as there are very positive aspects of these technological disruptions, there are also relevant problems and risks. Political activity requires discussion, debate, negotiation, and consensus. This is how the countries move forward, this is how the democracies are. No one can pretend to impose their ideas on everyone else in a democratic system. What happens is a process of deliberation through which the elected representatives construct solutions that are acceptable to a great majority of the citizens, without being able to give everything that is expected to the citizens and submitting to the popular evaluation in the next election. Social networks and platforms make this process more difficult. Indeed, they can in some cases weaken representative democracy, seeking mechanisms of direct or plebiscitary democracy. Politics requires a common space, a meeting place for those who have differences. Only in this meeting space can common solutions be built. Social networks avoid the existence of that common space. In fact, the algorithms and segmentations that the social platforms operate make the individuals be grouped with like-minded people and produce a segmentation that favors the reinforcement of one’s own thinking and limits exposure to different ideas. Self-referential groups are formed and the capacity for dialogue is severely limited. How to generate dialogue and build agreements when individuals are part of closed groups, that reaffirm their own beliefs and that they are not exposed to diverse ideas and points of view? In social networks, most debates lead to simple, or even simplistic, answers. These are plebiscite democracy schemes, that is, they are in favor or against something, a middle ground is not what is looked for. This is in contrast to the representative democracy that stimulates deliberation, negotiation and consensus. In a context of citizen empowerment, of crisis of the authorities and institutional vulnerability that is typical of the history of the continent, these elements and risks of social networks must be taken into consideration and be part of a profound political and social debate. Latin America and the Caribbean include a great diversity of countries. In terms of impact, attention is usually paid to what happens in Brazil and Mexico, given the size of their population and what they represent as markets. Argentina is also a focus of attention given its history of wealth, even though during the last century its progress deteriorated, institutions were weakened, and the country ceased to be part of the club of the developed countries. It is hoped that it can break the negative trend and start a new stage of successful projection into the future. Venezuela is today at the center of the discussion, but unfortunately it is for its dramatic institutional, economic, and social deterioration. But there are other cases of interest, especially if they are positive experiences. The cases of Costa Rica, Uruguay, and Chile are interesting examples of stability and progress. These are smaller countries in the region, and therefore objects of less attention. We stop in the case of Chile. Chile is recognized today as an exceptional and outstanding case of progress and institutional stability, which allows it to be in good condition to face the fourth industrial revolution and observe expectantly the challenges that this means for governance. The truth is that the country has a long institutional history. After its process of independence from the Spanish Crown started in 1810 came a stage of turbulence and adjustment that was consolidated with the Constitution of 1833, which managed to rule the country for almost 91 years, something exceptional in the continent. With a strong presidential system, the political system was consolidated (despite a brief civil war in 1891 generated by a political, budgetary, and constitutional debate). The Constitution of 1925 came to establish a new order and served as the basis for the political system until its infringement provoked by the failure of Salvador Allende’s socialist government in 1973. The coup led by the military led to a 17-year-old regime, which committed serious human rights violations, and, at the same time, laid the foundations for the current progress of the country, founded on the economic program led by a group of young economists from the University of Chicago and known as the “Chicago Boys.” Under the authority of Pinochet, this group of economists installed in Chile the ideas that Milton Friedman and others proposed for the economy, long before governments such as Reagan’s in the United States or Thatcher’s in the United Kingdom. The agreed and peaceful transition that occurred in 1990 generated an unprecedented fact. Pinochet had been defeated in a referendum of continuity in 1988 and had called for elections for the following year. A center-left coalition led by the Christian Democrats prevailed in the elections and led the transition by maintaining the essential aspects of the Chicago Boys’ economic model, further strengthening the implementation of social policies and Chile’s insertion in the world. 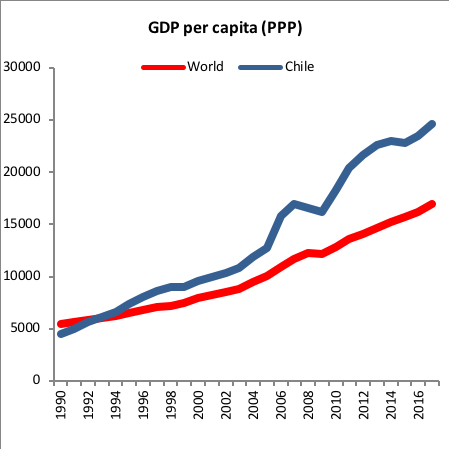 Today, after successive alternations in power between the two main political coalitions, Chile is a country of 17 million inhabitants, with the highest GDP per capita in the region of US $25,891 (PPP);49 located in the first place of LAC in the Human Development Index of the United Nations; leading the continent in the Digital Evolution Index; as a member of the OECD for a decade now; with a life expectancy at birth similar to the developed countries; and with social and economic indicators that realize an enormous progress. In addition, in terms of innovation and digital economy, it is recognized as a leader in the region, leading indicators such as the Index of Digital Economic Value for Latin America (2018). What elements explain this progress? It is difficult to offer an argument of causality. Rather, it is possible to describe some elements that help to understand the political and social dynamics of the country. From the seventies and then in the eighties, a profound modernizing process was initiated that included opening the economy and competition, freeing prices, reducing the size of the public sector, and designing a political and economic Constitution that would safeguard the right of property. Likewise, the reforms included the creation of a pension system focused on individual savings whose resources are managed by competing companies, a health protection system that includes the option of private and public health coverage, an educational system that encouraged the private sector to participate in the educational system with the aim of increasing coverage and generating competition, and a system of mining concessions that encouraged investment and development. Regarding the role of the State in the economy, an autonomous Central Bank was established, whose role has been to control inflation and which is prohibited from granting loans to governments. In addition, a strong privatization program was developed for many of the state-owned companies that had been created during the previous decades. It was also established that in the future state-owned companies can only be created by law, at the proposal of the President, and must have a supermajority in Congress to be approved. The political system consecrated a strong presidentialism, consistent with the historical tradition, but with a relevant set of checks and balances that limit the exercise of power. Thus, a bicameral Congress elected through a majority system of two seats per district (which was recently modified by a proportional one) generated a party system that had many political groups but grouped into two large coalitions that negotiated permanently to approve the changes. This generated a dynamic of stability and confidence. The acts of the President are reviewed administratively by the Comptroller General of the Republic, an autonomous body independent of the government. An independent judiciary with a Supreme Court and, in addition, a Constitutional Court to control ex ante and ex post the constitutionality of the norms generated a dynamic of strong presidential power but with an adequate counterweight. The Chilean bureaucracy is recognized as a competent institution, even though it has much to improve. Their capacities in the formulation and implementation of public policies have been very important for the success of the Chilean model. In short, Chile has good institutions that promote private initiative in an ambiance of freedom and competition and with a strong but counterbalanced government that develops social policies to improve the welfare of its citizens. That is what has happened in Chile in recent decades. But Chile is not without problems. Today, there are many who disagree with the changes implemented during the military government and projected in the governments of the Concertación. The emergence of a new middle class has posed new challenges, as has happened in other regions that generate progress. Several elements stress the present. The political system is in the process of change, with the recent implementation of a proportional electoral system for the congress, favoring representativeness but increasing fragmentation and possibly diminishing the willingness of political leaders to cooperate. The quality of education remains very weak, limiting the future opportunities of the new generations. Thus, unfortunately there remains the reality that origin is the best predictor of a person’s fate, an issue that contradicts the aspiration to make individual destiny depend on effort and merit. Economic growth continues but at somewhat lower rates than in the past. It has lost vigor and strength. The central explanation lies in the fall in the productivity of the country, an issue highly linked to its educational system and its labor market, which requires greater flexibility and adaptation. Linked to the above (productivity) is the need for the state to be more agile, efficient, and excellent, both to provide services to its citizens and to remove barriers that inhibit entrepreneurship, innovation, and creative destruction. The modernization of the state is a priority task for the country towards the future. Chile today can tell a story of success, but to project itself into the future, it requires understanding and addressing the new challenges, those that stress governance in a new interconnected and global world. Latin America is a continent in progress, but in a fragile state. Its political, economic, and social evolutions show progress but fail to consolidate a lasting and sustainable strategy over time. It requires faster advancement. It is a diverse continent. In its tens of countries throughout the region, there is a diversity of achievements, advances, and setbacks that require special views. Therefore, it is difficult to speak of the region as a whole, given the particularities and moments that each nation lives. LAC is a continent that is rich in natural resources, but it needs to review its strategy. The end of the super cycle of commodities, the fall in birth rates, the progressive aging of its population, and the risk of protectionism in some countries open the need to look for new strategies. The digital and technological revolution offers opportunities and challenges. In terms of opportunities, the continent already has an advance in Internet coverage and basic connectivity infrastructure. The fourth industrial revolution offers a leapfrog opportunity for LAC, promoting the massification of banking access through FinTech; the speed and quality of health care through eHealth; the increase of ecommerce; the personalization of education and life-long learning; and the planning, development, and improvement of urban life through smart cities. In governmental matters, technology offers a huge opportunity. A clear example is the digitalization and simplification of procedures for citizens and the development of new citizen service platforms. Another opportunity is to advance in the culture of open governments, which strengthen transparency, participation, and accountability. Likewise, there is a huge opportunity to develop project laboratories and pilot programs and to learn from the huge volumes of data to generate useful, timely, and relevant information for decision-making. To advance these challenges, LAC must focus on training minds rather than training machines. Then, it must continue to strengthen investment in infrastructure and the participation of the private sector to innovate and be the protagonist of the destructive creation of the future. It also requires governments that can give confidence and certainty to investors and international counterparts. But just as there are opportunities, there are also risks and challenges. The technological eruption has also penetrated the political dynamics, the way to campaign and to communicate from the government. Social networks and platforms have allowed the development of new and interesting forms of citizen participation and have collaborated in the identification of new forms of activation and political mobilization. All this has empowered the citizens. However, social platforms are creating groups and sub groups that listen to themselves and move away from the common dialogue. Social networks, through segmentation and data management, are transformed into a space for reinforcing one’s convictions, limiting exposure to the ideas of others. The negotiation, the transaction, or the search for agreements and consensus are much more difficult. The interaction model of social networks is more typical of a plebiscitary democracy than of a representative democracy. This tension between the democratic schemes will be at the heart of a middle-class continent that looks uncertainly into the future. Latin America and the Caribbean face the future with enormous opportunities, uncertainties, and challenges. Ernesto Silva is a distinguished visiting fellow at the Hoover Institution and the former president of Chile’s Unión Demócrata Independiente (UDI) party. Accenture Digital, 2018. El avance de la economía digital en Chile: Optimizando las capacidades digitales para optimizar el crecimiento. Acemoglu, Daron and J. Robinson. 2013. Why Nations Fail: The origins of power, prosperity and poverty. Profile Books, London. CAF, Banco de Desarrollo de América Latina, 2016. Hacia la transformación digital de América Latina y el Caribe: El Observatorio CAF del Ecosistema Digital. Corporación Latinobarómetro, 2018. Informe 2018.
de Tocqueville, Alexis, 2000. Democracy in America. The University of Chicago Press. Drake, Paul, 2009. Between Tyranny and Anarchy: A History of Democracy in Latin America: 1800-2006. Stanford University Press. Duryea, Suzanne and Marcos Robles, 2017. Legado Familiar: ¿Rompemos el molde of repetimos patrones? Pulso social de América Latina y el Caribe 2017. Inter-American Development Bank, Washington DC. ECLAC, 2017. Estado de la banda ancha en América Latina y el Caribe. ECLAC, 2018. eLAC 2018 La Revolución Digital: Monitoreo y seguimiento eLAC2018: estadísticas e indicadores. Documento Preliminar. ECLAC, 2017. Observatorio Regional de Banda Ancha (ORBA) de CEPAL, con base de datos de UIT, World Telecommunications Indicators Database, 2017. Datos OECD excluyen a Chile y México. ECLAC, 2017. Observatorio Regional de Banda Ancha (ORBA) de CEPAL 2017, con base de datos de Cisco Systems. Ferguson, Niall and D. Lansberg-Rodríguez, 2017. The Constitution of Disposability. Santiago, Fundación Para el Progreso. Hayutin, Adele, 2018. Comparatie Demographics of the Western Hemisphere. Hoover Institution. Stanford University. IDB, 2017. Políticas Públicas para la creatividad y la innovación: Impulsando la economía naranja en América Latina y el Caribe. José Miguel Benavente y Matteo Grazzi. IDB, 2018. Fin del trámite eterno: ciudadanos, burocracia y gobierno digital. Benjamín Roseth, Angela Reyes, Carlos Santiso, editores. IDB, 2018. Social services for digital citizens: opportunities for Latin American and the Caribbean. Cristina Pomo, Ravi Gupta, Mirjana Stankovic. IDB, 2018. Better Spending for Better Lives: How Latin America and the Caribbean Can Do More with Less. Washington DC. IDB, 2018. Panorama de la efectividad en el desarrollo (DEO). IMF, 2018. Regional economic oultook. Western Hemisphere: Seizing the momentum. World economic and financial surveys. Washington, DC. IMF, 2018. World Economic Outlook, Challenges to Steady Growth, October 2018. Washington DC. Izquierdo, Alejandro, Carola Pessino and Guillermo Vuletin, editors, 2018. Better spending for better lives: how Latin America and the Caribbean can do more with less. LAPOP, Latin American Public Opinion Project, 2017. The Political Culture of Democracy in the Americas, 2016/2017. A Comparative Study of Democracy and Governance. Monteiro, L. Felipe, G. Rozman, A-M Carrick, 2018. Digital Transformation in Latin America: A Leapfrogging Opportunity? Case Study, INSEAD Business School. Negretto,Gabriel, 2015. La política del cambio constitucional en América Latina. México. Fondo de Cultura Económica. OECD, 2018. A Broken Social Elevator? How to Promote Social Mobility, OECD Publishing, Paris. OECD, 2018. Latin American Outlook. Rethinking Institutions for Development. OECD Publishing, Paris. OCDE, 2016. Gobierno digital y abierto, Panorama de las Administraciones Púbicas, América Latina y el Caribe 2017. París. Ridley, Matt, 2010. The rational optimist: How prosperity evolves. New York: Harper. Rojas, Mauricio, 2018, La Fragilidad de la Democracia en América Latina: Perspectivas Analíticas y las experiencias de Argentina, Venezuela y Chile. En La Democracia Asediada. Instituto Res Pública, Santiago. Subsecretaría de Telecomunicaciones, Chile. 2017. Chile, Ecosistema digital 2017-2030. UNDP, 2018. UNCTAD (Conferencia de las Naciones Unidas sobre Comercio y Desarrollo) 2016. “UNCTAD B2C E-Commerce Index 2016 Technical Note on ICT for Development N 7. Santiago de Chile. UNCTAD (Conferencia de las Naciones Unidas sobre Comercio y Desarrollo) 2016. Examen de la armonización de la ciberlegislación en América Latina, 2015. Nueva York y Ginebra. Human Development Indices and Indicators, 2018 Statistical Updates. Vegh, Carlos A., Guillermo Vuletin, Daniel Riera-Crichton, Juan Pablo Medina, Diego Friedheim, Luis Morano y Lucila Venturi, 2018. “Sobre incertidumbre y cisnes negros: ¿Cómo lidiar con el riesgo en América Latina y El Caribe? LAC Semiannual Report (octubre), Banco Mundial, Washington, DC. WHO 2015. Atlas of eHealth country profiles. The use of ehealth in support of universal health coverage: based on the findings of the third global survey on ehealth 2015. Ginebra. World Economic Forum, 2018. The Digital Enterprise: Moving from experimentation to transformation. World Economic Forum, 2018. For Latin America to thrive in the digital era, it must first teach minds, then the machines. https://www.weforum.org/agenda/2018/03/here-s-how-latin-america-can-thrive-in-the-digital-era/ (consultado el 24 de noviembre de 2018). 2 IDB, 2018. El Fin del Trámite Eterno: Ciudadanos, burocracia y gobierno digital. Washington DC. 3 ECLAC, 2017. Estado de la Banda Ancha en América Latina y el Caribe. 4 Fundación País Digital, 2018. Santiago, Chile. 5 Mauricio Rojas, La Fragilidad de la Democracia en América Latina: Perspectivas Analíticas y las experiencias de Argentina, Venezuela y Chile. En La Democracia Asediada, 2018. 7 Paul Drake, Between Tyranny and Anarchy: A History of Democracy in Latin America: 1800-2006. Stanford University Press, 2009. 8 Niall Ferguson y Daniel Lansberg-Rodríguez. The Constitution of Disposability. Santiago, Fundación Para el Progreso, 2017. 9 Gabriel Negretto. La política del cambio constitucional en América Latina. México. Fondo de Cultura Económica, 2015. 10 Uruguay, Chile and Costa Rica are recognized as exceptions that have managed to consolidate their institutions and project their rule of law. 11 Mauricio Rojas, op. cit. 12 Alexis de Tocqueville. La democracia en América. The University of Chicago Press, 2000. “Among the new objects that attracted my attention during my stay in the United States, none struck my eye more vividly than the equality of conditions. I discovered without difficulty the enormous influence that this primary fact exerts on the course of society; it gives a certain direction to public spirit, a certain turn to the laws, new maxims to those who govern, and particular habits to the governed”.... “So, therefore, as I studied American society, more and more I saw in equality of conditions the generative fact from which each particular fact seemed to issue, and I found it before me constantly as a central point at which all my observations came to an end”. 13 Daron Acemoglu y James Robinson. 2013. Why Nations Fail: The origins of power, prosperity and poverty. Profile Books, London. 14 Obviously, there are exceptions in some countries where the political party system has managed to consolidate. 15 Mexico advances in this direction to this trend with the election of Andrés Manuel López Obrador. 16 IMF, World Economic Outlook, Challenges to Steady Growth, October 2018. Washington DC. 17 IMF, World Economic Outlook, April, 2018. Washington DC. 18 IMF, October 2018. Figures for 2018 and 2019 are projected. 19 IMF, World Economic Outlook, Challenges to Steady Growth, October 2018. Washington DC. 20 World Bank, 2018, p. 12. Figures for 2018 are projected. 21 IMF, October 2018. Figures for the year 2018 and 2019 are projected. 22 IMF, World Economic Outlook, Challenges to Steady Growth, October 2018. Washington DC. 23 World Bank, 2018. Sobre incertidumbres y cisnes negros: ¿Cómo lidiar con riesgo en América Latina y el Caribe. Informe Semestral – Oficina del Economista Jefe Regional. October, 2018. 24 World Bank, idem, page 6. 25 IDB, 2018. Better Spending for Better Lives: How Latin America and the Caribbean Can Do More with Less. p 45. 26 Ridley, Matt, 2010. The rational optimist: How prosperity evolves. New York: Harper. 27 Pew Research Center 2015. Corresponds to millions of people whose income varies between 0 and more than US $ 50 per day. 28 See TIMSS and PISA scores. 30 OECD, 2018. A Broken Social Elevator? How to Promote Social Mobility. Paris, OECD Publishing. 31 IDB LAC 2018 Report, page 12. 35 ECLAC, 2017. Estado de la Banda Ancha en América Latina y el Caribe. 36 Observatorio Regional de Banda Ancha (ORBA) de CEPAL, con base de datos de UIT, World Telecommunications Indicators Database, 2017. Datos OECD excluyen a Chile y México. 37 Observatorio Regional de Banda Ancha (ORBA) de CEPAL 2017, con base de datos de Cisco Systems. 38 ECLAC, Estado de la Banda Ancha en América Latina y el Caribe. 39 UNCTAD (Conferencia de las Naciones Unidas sobre Comercio y Desarrollo) 2016. “UNCTAD B2C E-Commerce Index 2016 Technical Note on ICT for Development N 7. Santiago de Chile. 40 UNCTAD (Conferencia de las Naciones Unidas sobre Comercio y Desarrollo) 2016. Examen de la armonización de la ciberlegislación en América Latina, 2015. Nueva York y Ginebra. 41 OCDE, 2016. Gobierno digital y abierto, Panorama de las Administraciones Púbicas, América Latina y el Caribe 2017. París. 43 WHO 2015. Atlas of eHealth country profiles. The use of ehealth in support of universal health coverage: based on the findings of the third global survey on ehealth 2015. Ginebra. Percentage refers to the simple of country, nota all of them are included. 44 Social services for digital innovation. 45 Digital Transformation in Latin America: A leapfrogging opportunity? 2018. INSEAD Business School. Case Study. 46 Health Systems Leapfrogging in Emerging Economies Ecosystem of Partnerships for Leapfrogging. The World Economic Forum. Vincent Fortaleza and Arnaud Bernaert in collaboration with BCG. 2017. 47 Ljubica, N. And G. Quintini, 2018. OECD Social, Employment and Migration Working Papers 202. 49 In the year 1960, for example, Chile was surpassed in GDP per capita by Venezuela, Mexico, Argentina and Brazil.